Have you ever wondered what it takes to build a marketplace like eBay or Etsy? Is there much to it or do you have to spend an insane amount of money to get the ball rolling? If you complete just a little bit of research on Google you’ll see that all of the most popular marketplaces started as bare-bones as they come. Amazon was initially a basic HTML site, while Etsy and eBay have both seen their fair share of questionable designs (at least when looking back on them). That said, many marketplaces do take quite a bit of programming knowledge, startup capital and manpower to launch. But things have changed, because now all you have to do is install WordPress and a beautiful marketplace theme to make a pretty incredible marketplace, for both physical and digital products. The marketplace business is tricky to get into since it seems like every good idea has been taken. However, tons of them pop up every year, with more niche focuses that bring in lots of money. So, if you’re thinking about making a marketplace eCommerce site like Etsy or eBay, this is the place to be. Before doing anything, you must find a domain name, and hosting provider. I recommend searching for the hosting provider first, since you can generally buy the domain name directly from them. All of the above options make for good hosts, at least for startups. Basically, you’ll want to go with a shared hosting account when getting started. This is the cheapest pricing plan, but you can always upgrade when you start getting more traffic. After you’ve selected your hosting plan, the host will generally ask you what you’d like your domain name to be. Go ahead and search for the domain name of your choice until you find one that’s available. Finally, you’ll want to go to the CPanel to install WordPress. 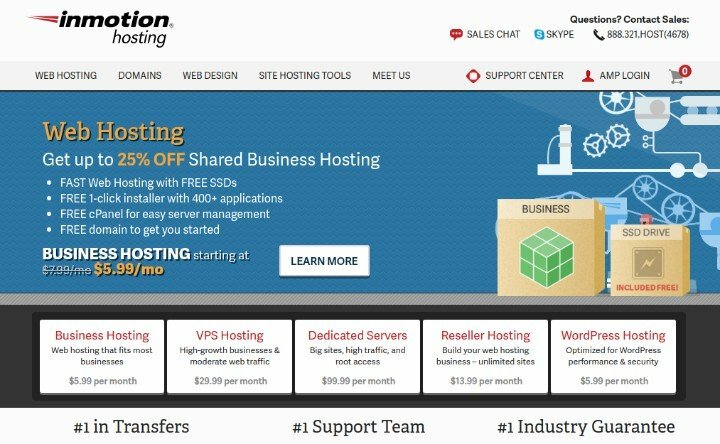 The majority of reputable hosting companies now offer a one-click WordPress installation. Simply follow the steps on your screen and you shouldn’t have any problems. After that, you’re ready to move on. 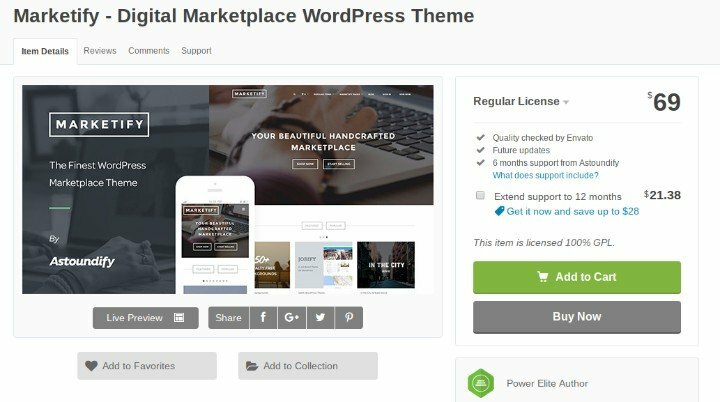 A handful of WordPress themes are available for launching a full marketplace, but none offer the features and functionality like Marketify. It’s a full-fledged, modern looking theme, with options for digital and physical products. It combines with Easy Digital Downloads (see our review), along with various other plugins for improving your site. Not only that, but the vendors and users can all make their own profiles and run through the purchase process without having to pay different vendors separately. Since we’re going with Marketify, go ahead and find the download page on ThemeForest (also a marketplace). Right now the theme costs $69, which is pretty impressive considering the tools offered. Signup or login to your ThemeForest account in order to walk through the checkout section. Buy and download the theme to your computer. After that, you’ll navigate to your WordPress dashboard. Go to Appearance > Themes. Click on the Add New button, then the Upload Theme button. You’ll see a Choose File option which you should click on. This brings up all of the files on your computer. Select the .zip file containing the Marketify theme. Hit the Install Now button, then Activate the theme to complete the process. There you have it! Your marketplace website is ready for customization. Three views come along with the Marketify theme: One for the buyers, one for the admin, and one for the vendors. The theme doesn’t really have any additional plugins that are required for your physical product marketplace to work. However, anyone interested in making an efficient digital product store (like ThemeForest) would have to download and install both Easy Digital Downloads and the Digital Marketplace Bundle. such as Frontend Submissions and Reviews. But like I said, none of these are completely required unless you want that type of functionality. Just keep in mind that the Digital Marketplace Bundle has all of the Easy Digital Downloads extensions needed. One extension that’s essential for turning this into a physical product marketplace is the Simple Shipping extension. As for the theme design, it actually looks pretty good out of the box. You’ll have to upload your logo and adjust some colors to make things branded towards your company, but that shouldn’t take long. You do have to worry about a few design/user interface elements in order to make sure your merchants and users know where to go. For example, how do your vendors configure their own little shop and post products? That’s all done by logging in as a vendor, then going to the Author Dashboard button. Keep in mind that an author is considered a vendor. Go to the Add Products tab. Here you can fill in everything from product names to preview images. 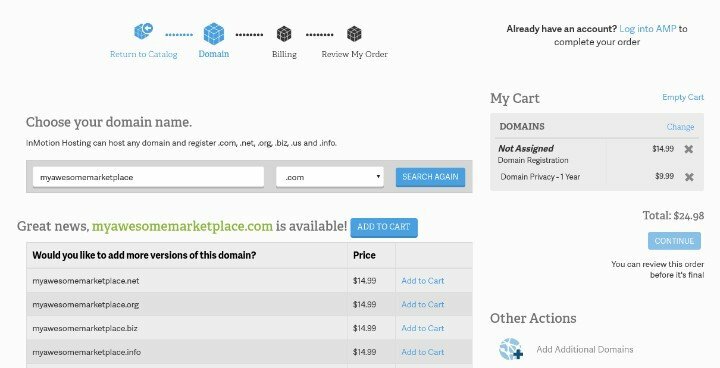 You can also change around categories, pricing and demo URLs. After completing a few of your products you can go to the Products tab. This reveals a list of the items that are active and not active. ou can edit the payment gateways by going to Downloads > Settings > Payment Gateways. All of the solutions, both paid and free, are located here. Choose how much commission you would like to collect and set those on the backend of your website. 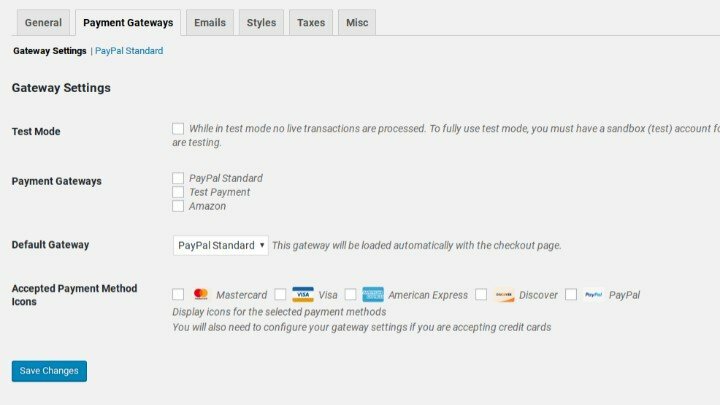 Under the Settings tab they have an area where you can punch in the PayPal address to receive commissions. In addition, going to Author Dashboard > Earnings provides a list of all the sales and commissions per sale. Clicking on the Orders tab in the Author Dashboard is a great way for the vendors to see details on each purchase. For example, they can view whether or not the order has been completed, along with customer information and the product in which they purchased. Buyers aren’t going to make any purchases from vendors if the little vendor shops don’t look finished. Therefore, it’s the admin’s job to instruct all vendors to complete their profiles. All they have to do is go to the Profile page in the Author dashboard, then fill in everything like biographical information, their website, the name of the store, an email and a profile background. 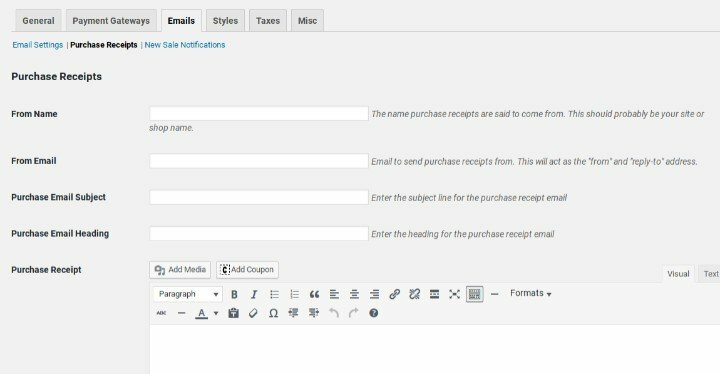 Purchase receipts and email confirmations are made by default in Easy Digital Downloads. However, a physical product marketplace would want to remove the link to digital products in the messages. So, go to the Downloads tab in your WordPress dashboard. Then click on Settings > Emails. Adjust the emails however you want, and feel free to utilize shortcodes to make things easier. You’ll want buyers and sellers to have different login/registration pages. You can make these by creating brand new pages through WordPress. Go to Pages > Add New, then drop the [edd_register] shortcode in the buyer (or user) registration page. Drop the [fes_registration_form] vendor code in the merchant registration page you just created. After that, it all comes down to how you want to customize your marketplace further and how you go about marketing it to other people. For instance, no one is going to buy from your marketplace if you don’t have enough quality merchants to choose from. Therefore, it’s essential to contact merchants that relate to your niche, pitching them that they can make even more money through your marketplace. After that you’ll have to get the word out to buyers so that they come and start making purchases. To wrap things up let’s go through the basics of configuring your online marketplace. First you’ll need a WordPress site and the Marketify theme. This provides support for a full digital product marketplace, but you can get more advanced features with Easy Digital Downloads. 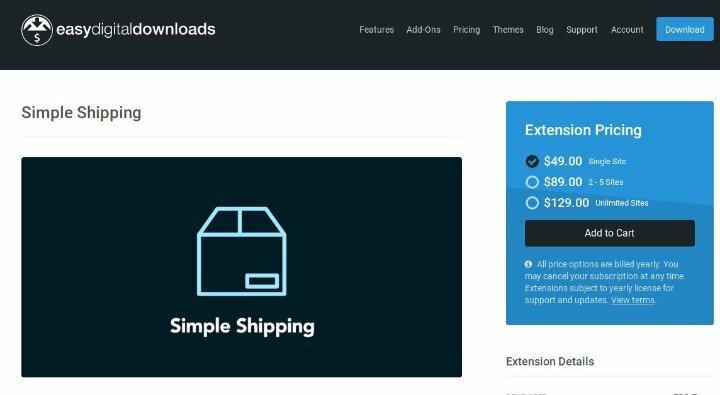 In addition, a physical product marketplace requires the Easy Digital Downloads extension called Simple Shipping. Along with regular branding modifications and the building of vendor and buyer pages, you should be well on your way to creating a marketplace like Etsy or eBay. What’s more is that this Marketify + EDD + WordPress combination is ideal for marketplaces selling both physical and digital products at the same time. I hope you enjoyed our guide on building a marketplace using Marketify theme. If you did, you may also want to check out our guide on how to create an eCommerce store using WooCommerce. If you have any questions about this process, let us know in the comments section below.